I'm sure he would be happy to know t...hat we gathered to celebrate his music for which he lived. On this occasion, I will be in New...hall, and I hope to see you there. As we all know , this year will be the 40th anniversary of gene's passing . Although this is no date to celebrate , as we all wish gene would still be with us , it is an opportunity to remember him even more than we normally do . Maybe some of you are planning to come to Newhall in California , which is gene's resting place . If so , Lonely street would like to hear from you , so that every fans from all over the world would have a chance to be together on october 12th . As I am a Newhall CA resident myself and a longtime gene's fan , I'd love to be of help for those visiting . We could all regroup by the end of the day in a special place playing Gene's music with food and drinks . I already have some ideas but would like to know how many of us are interested in getting togeter . Lee-Loo create a face book page , where everyone coming can leave his/her name and a brief message . I look forward to see as many of you as possible and make that anniversary day a memorable one . Comme nous le savons déjà . cette annee sera celle du 40eme anniversaire du décès de Gene . Bien que ce ne soit pas une date à celebrer , puisque nous souhaiterions tous que Gene soit encore parmi nous, c'est une opportunité de penser a lui encore plus que la normale. Peut être certains d'entre vous envisagent-ils de venir à Newhall en Californie , qui est l'endroit où Gene repose. Si tel était le cas , faites le savoir à Lonely street, pour que les fans de tous les coins du monde puissent avoir une chance d'etre ensemble le 12 octobre 2011. Comme je suis moi meme un resident de newhall, et un fan de longue date de Gene , j'aimerais pouvoir aider ceux qui viendront visiter. Nous pourrions tous nous retrouver à la fin de cette journee dans un endroit spécial qui jouerait la musique de Gene avec nourriture et boissons disponibles pour qui le desirerait. Lee-Loo a créé une page sur Facebook, où tous ceux qui viennent peuvent laisser leur nom et un message bref. J'attend impatiemment pour voir autant que possible d'entre vous et de faire de cette anniversaire une date memorable. C'est avec émotion que je vous rencontrerai, tous ensembles pour ce 40eme hommage pour Gene Vincent. Je suis certaine qu'il serait content de nous savoir réunis pour célebrer sa musique pour laquelle il vivait. A cette occasion, Je serai à Newhall, et j'espère vous y rencontrer. 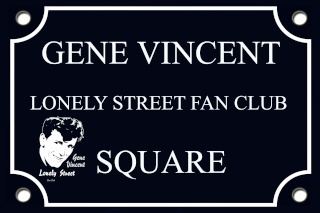 It is with emotion that I'll meet you, all together for this 40th tribute to Gene Vincent. Maybe this time, you will like me, need to be with Gene for this date. I'm sure he would be happy to know that we gathered to celebrate his music for which he lived. On this occasion, I will be in Newhall, and I hope to see you there. Como todos sabeis, este año será el 40 º aniversario de la desaparición de Gene Vincent. Aunque esta no sea una fecha para celebrar, ya que desearíamos que Gene permaneciera con nosotros, pienso que sería una oportunidad para recordarle, incluso más de lo que normalmente se hace. Tal vez alguno de vosotros esté planeando ir a Newhall, en California, que es lugar donde descansa Gene. Si es así, a "Lonely Street" le gustaría conocerte, con el objetivo de que todos los fans del mundo tendrían la oportunidad de estar juntos el 12 de octubre. Como soy vecino de Newhall CA, a mí y a muchos fans de Gene desde hace mucho tiempo, nos encantaría ser de ayuda para aquellos que nos novisitan. Podríamos reagruparnos todos al final del día en un lugar especial para escuchar música de Gene con alimentos y bebidas. Ya tengo algunas ideas, pero me gustaría saber cuántos de nosotros estamos interesados?en reunirnos. Lee-Loo ha creado una página en Facebook, donde todos los que vengan pueden dejar su nombre y un mensaje breve. Estoy deseando de verme como muchos de vosotros y que ese día sea un inolvidable aniversario. Delegado a la del club de fans Lonely Street EE.UU. ¡A cada uno de los fans de Gene! Estoy emocionada de reunirme con vosotros para conmemorar todos juntos este 40 aniversario. En esta ocasión necesito estar con Gene por esta fecha. Estoy segura que él sería muy feliz al saber que nos reunimos para celebrar su música, para la cual el vivió. En esta ocasión voy a estar en Newhall y espero veros por allí. OPEN MICRO – FREE ! 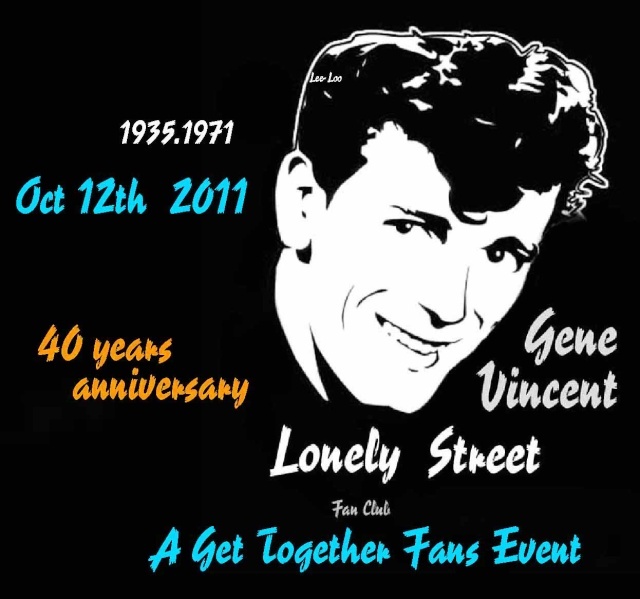 I have the great pleasure to come to you to make official the october 12th event for Gene Vincent ‘s 40th anniversary . This place is well known in the Los Angeles area and more particularly in the San Fernando Valley to be a place of choice for rockabilly and americana music so it was a natural choice .I am very happy that we could make an agreement . We will start at 6:00 PM with food and drinks available for all . If we have enough people interested we can have a buffet at the cost of 10 US Dollars per person . If we go that route that would help the kitchen ( and us ) to avoid chaos in the orders and everything would be ready right away when we get on the premises. The owner is very excited to host our gathering and is trying to help in any respect to help us to get the best out of the evening . The first part of the event from 6:00 PM to 8:00 PM , as I mentioned before will be about mingling with all the fans coming to honor Gene’s memory with good food and drinks . We will be playing recorded music from Gene’s entire recording career and beyond. 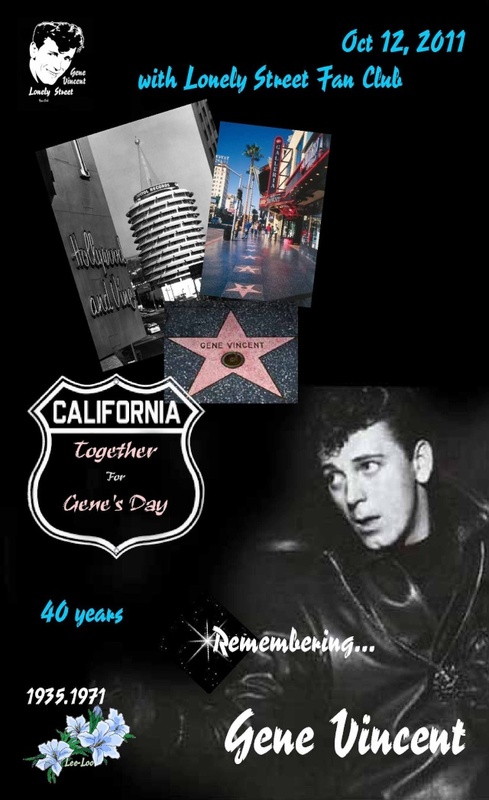 During this period of 2 hours , everyone that will express the desire to speak about their experience with gene , their memories , or simply to express their love to him will register next to the stage preparing for the second half of the evening starting around 8:00 PM . We will have a full stage with microphone and sound system to accommodate . I received a few request for playing live music during the evening and I know that a lot of participants will be musicians . We initially didn’t want to have the evening as a single band show based event to keep the whole gathering about gene himself and the fans , but he most probably would love live music to be part of it , so decision has been made to let the show go on and unfold as it is meant to be . Everyone that will desire to perform can register , starting now , so we can schedule the evening in an organized manner . Let me know who you are , what you are planning to perform and if you have musicians/instruments with you or if you need some , as we will have just the basic sets of drums , guitar and bass available . All of that is taking life in a very organic way and what started as a simple get together and have a drink is transforming into a more pleasant memory making evening . With your help and ideas we’ll continue to make it evolve and we’ll gladly receive any suggestions from you all . 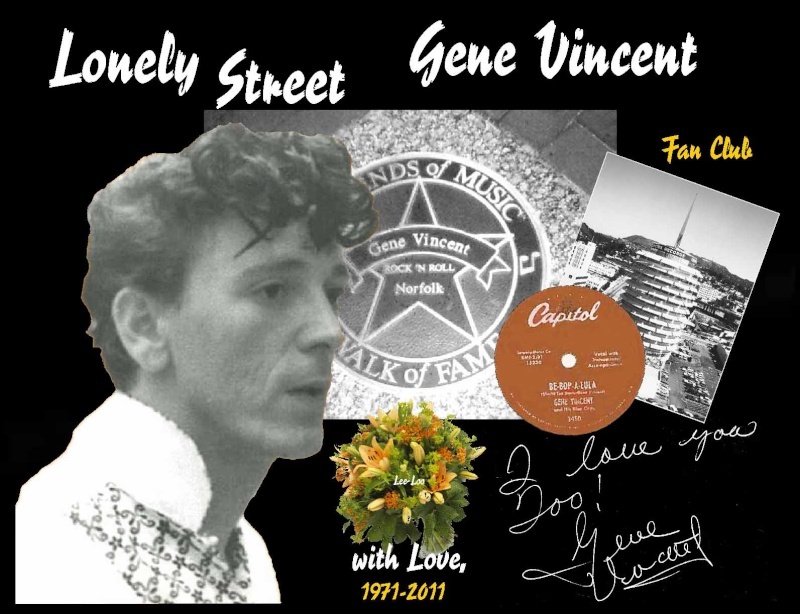 It is your event after all which is meant for Gene Vincent , to be with him the best way we can in a sincere honest way . We might be able to accommodate last minute decisions to play or sing but no guarantee can be made that it would be possible depending on the demand , so register as early as possible , but know that you can always come from 6:00 PM to 8:00 Pm the very day and formulate your demand . You can email me for requests or questions at » chrisbouyer7@yahoo.com » or through the fan club lonely street on Facebook . She’s had , for the last five years , a life completely dedicated to gene and she accomplished the purest act of love by not counting her time , sweat , and frustrations sometime , all of that without any resources to unify all the fans under the same roof , so to speak . So hats off to her for what she did and I am proud to contribute to this effort to materialize even more on october 12th . To summarize please let me know if you want to have a buffet for the cost of 10 Dollars per person ( Joe’s place free ) and also if you would like to perform . I look forward to talk to everyone that express the desire to do so and I’ll be available from this day until october 12th to make magic happen and be the coordinator of what you , as fans , want to make out of the experience . It will be very emotional to meet you all on the occasion of gene’s 40th anniversary of his passing . I’m sure he would be happy to know that we gathered to celebrate his music for which he lived. On this occasion, I will be in this event in California, and I hope to see you there. 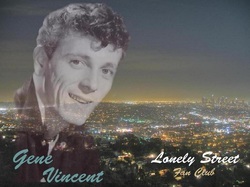 Exceptionnellement, pour être écouter également en Califonrie avec 9heures de décalage en moins que la France - Jolio's party radio diffusera un special Gene Vincent les 11 et 12 octobre http://www.radionomy.com/fr/radio/jolio-s-party - restez connectés ! 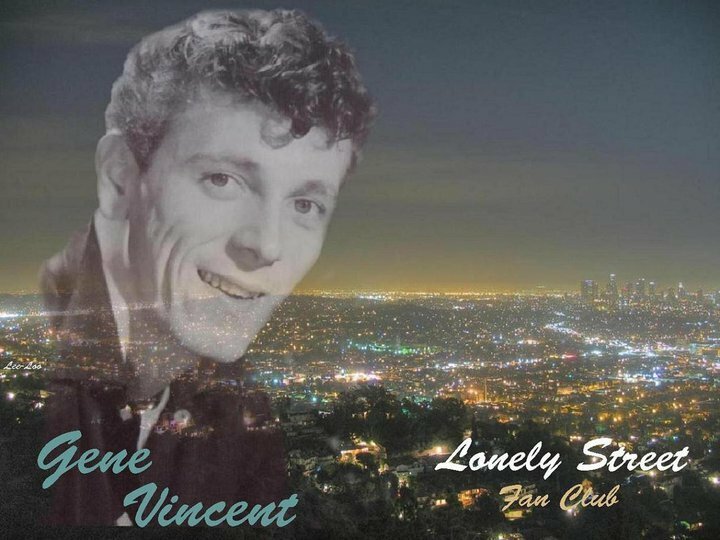 exceptionally, to be listening also Califonrie with 9 hours of shift unless/ France - Jolio's party radio broadcast a special Gene Vincent 11 and October 12 http://www.radionomy.com/fr/radio/jolio-s-party - stay online! PHOTOS - VIDEOS ...........SOON ! 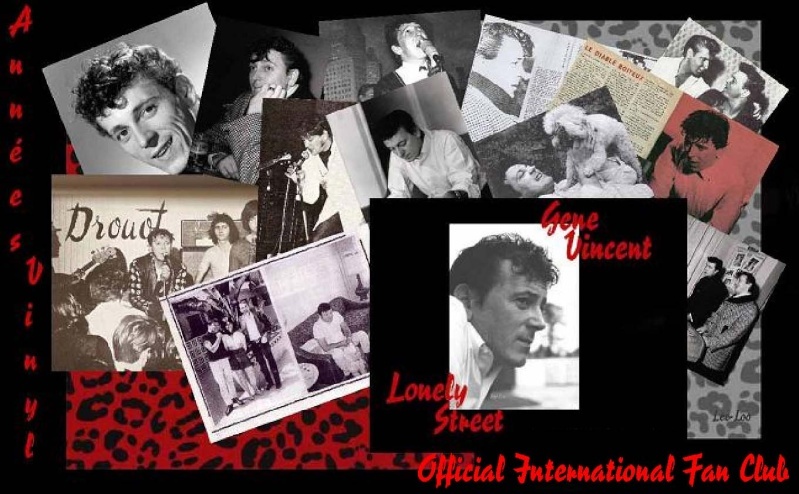 Join the International Gene Vincent Fanclub "Lonely Street"